In the Sanzen Room, where Rinzai Zen Masters conduct formal interviews with their students, they require the aspirant to present their understanding with their whole being. Mere verbal play is rewarded with a quick dismissal, if lucky, or even a quick blow. At Mt. Baldy Zen Monastery, my first few months’ answers to the initial koan (a kind of question used to test of one’s insight into reality) I was given were gently laughed off, and often I was dismissed before I could even open my mouth. After exhausting every conceivable approach, I was left with an interior devastation that I could not have imagined. Somehow, the inquiry proceeded regardless, on a level I had never known, nor can even now describe. More months followed, and I became very quiet, absorbed in an internal process deeper than thought. The shell of the self-construct, or what some call the personal story, suddenly cracked open early one morning during Kinhin (15 minute walking meditation interspersed between hour-long sitting sessions). It was during a sesshin (a week-long intense meditation interrupted by 4 visits a day with the Master) . As I walked in the slow procession, shivering in the predawn icy mountain chill, my heart suddenly welled up into my throat, and then something exploded there, and I was overtaken with convulsive sobs, so much so that I had to be led to the side to recover. All that I had cherished about any sense of self was obliterated in an instant — as if it had never existed in the first place — and I stood alone in the universe, which was nothing but my own immense body, within which an unspeakable silent perfection manifested as the immaculate nature of awareness-being itself. These are only words for something that words cannot truly touch. 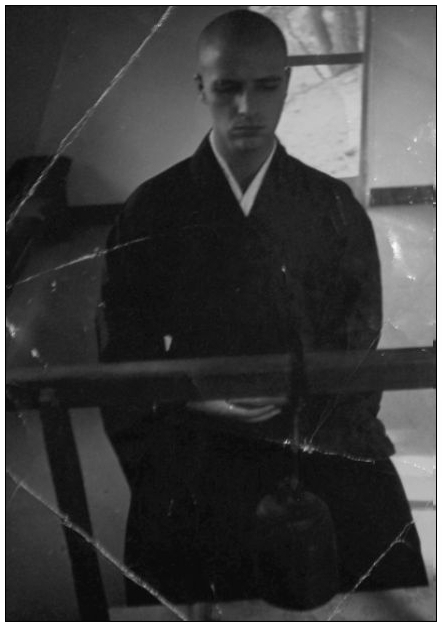 I don’t have much memory of the weeks that followed (it felt as if I was in a serene floating world, not even in a body), but about a month later, in Sanzen, when he finally asked for an answer to my koan, I spontaneously shot my arm up and shouted a monosyllabic reply that surprised both of us. Now I was ready to begin in earnest . . . .
About a year later, I had reached a point in my practice in which even the overlay of “zen” on whatever this IS had simply become so excruciating that I walked out of my cabin in the middle of the night, dressed in my thin cotton robe in freezing weather, and not even giving a damn where I was off to. About an hour later I found myself way up the side of the mountain, well above the small monastery nestled below, but now vaguely heard the faint but growing sound of the monks and students beginning the morning sutra chants, and this infuriated me! I rolled around on the ground, threw rocks in the air, smashed logs into trees, and finally just sat down, numb. The chanting continued. I began to weep, not because of what the sutras were proclaiming, and not even because of the dearness of the fools down there going on in that strange fusion of one syllable Sanskrit and Japanese that constitutes the traditional zen chants, but just because …. Just because of what? Who knows? I just wept. Somehow, in the midst of those tears, it suddenly struck me how sweet the mountain air was, how fresh the morning breeze, how dazzling the dawning blue sky! I relaxed and just let go. All my cares dropped away like tattered old robes. I felt utterly clear, reborn, in love, but I didn’t know with whom, nor did it matter. Hours passed. I had stopped weeping and just sat there on a rock, at peace, with a huge grin on my face. 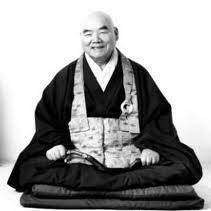 I missed the morning Sanzen (interview with the master). Roshi sent someone out to look for me. Somehow, I knew this, I “experienced” Roshi beckoning me, so what the hell, who cares, I walked back down the mountain and eventually found myself kneeling in front of him in his room. He sat facing me, studying my face, it seemed, and assessing my state. For the first time, I had no interest in his remarks. Who cares? He’s a bald-headed little man with poor English. I said nothing. He looked at me, I looked at him. There was nothing happening. There had never been anything happening, except this ridiculous game of persona, and frankly, I couldn’t raise an idiot’s thought about any of it. Contrary to the pop-psych cliché, this was not a form of disassociation, although there were certainly aspects of it that would seem so. There was no preference, no sense of polarities, not even any movement in mind — just the immediacy of the moment, of free bare attention itself — just this clear transparency of now. All my previous quandary and frustration had long vanished, and I felt no relation to the person who had earlier stormed up the side of the mountain in the middle of the night. There was simply this, without any superimposition. It wasn’t zen, it wasn’t me, it wasn’t any of a thousand names we use to attempt the impossible – describing “this”. Nevertheless, it is no different than what is right now — these fingers typing away, your eyes glancing over the little dots and dashes, earth spinning around the sun, the galaxies turning in vastness, the same vastness that moves these fingers, your eye muscles, our heart. Roshi finally made a kind of grunt, nodded to me, and I got up and walked out of his room and into myself, and what that is I still can’t say with any words of men or gods, but it’s certainly not a problem to be solved nor a riddle to be figured out, and that’s fine with me. This entry was posted in Autobiographical Fragments. Bookmark the permalink. Wisdom Publications has recently published my account of the time I spent in a Zen Monastery (1971-73), in their Winter Series on Spiritual Retreats.